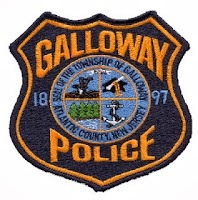 Galloway Township Police responded to 800 calls for service during August 3, 2014 through August 9, 2014. Additional statistics include: 6 Burglaries, 16 Motor Vehicle Accidents, 85 Tickets issued, 3 Driving While Intoxicated, 35 Arrests, 13 Domestic Violence, 12 Fire Calls, 91 EMS Calls and 0 Juvenile calls. Dawn M. Linsalata, 38, of Galloway was arrested by Ofc. Kevin Welsh for possession of hypodermic needles & possession of CDS on August 3. David A. Curtin, 21, of Galloway was arrested by Ofc. Bill Kline for possession of hypodermic needles on August 4. Louis J. Deinert III, 26, & Stefanie M. Deinert, 29 both of Millville were arrested by Ofc. Bill Kline for endangering the welfare of a child on August 4. Kimberly E. Cairnes, 48, of Hamilton Twp. and Charlene D. Lee, 50, of Egg Harbor were arrested by Ofc. Carolyn Buckley for possession of drug paraphernalia on August 5. Sherwood A. Cross, 36, of Galloway was arrested by Det. Bryan Casey for possession of CDS, distributing CDS, and possession of more than 50 grams of marijuana on August 5. Carnell B. Davis III, 34, of Galloway was arrested by Ofc. Kevin Costa for causing serious injury while driving while suspended on August 5. Kareem A. Harris II, 22, of Pleasantville was arrested by Ofc. Dominic Fabrizo for obstructing the law, possession of drug paraphernalia, resisting arrest by flight, and possession of less 50 grams of marijuana on August 5. Patrick S. Collins, 27, of Hamilton Twp. was arrested by Ofc. Jacqueline Crocker for contempt on August 6. Zeeshan Zia, 32, of Brooklyn was arrested by Ofc. Vincent Ceci for assault by auto and DWI on August 7. Dean P. Trava, 45, of Ridgewood was arrested by Det. Ryan Goehringer for possession of less than 50 grams of marijuana on August 8. Mack D. Nelson, 52, of Pleasantville was arrested by Ofc. Scott Winneberger for contempt on August 8. John A. Marmaduke, 21, of Galloway was arrested by Ofc. Kerry Baerman for possession of CDS on August 8. David S. Devane, 41, of Galloway was arrested by Ofc. Hiram Melendez for possession of CDS and possession of drug paraphernalia on August 8. John J. Broomhead III, 28, of Mays Landing was arrested by Ofc. Dominic Fabrizo for DWI, shoplifting, and possession of drug paraphernalia on August 9. Xi Yun Ye, 39, of Galloway was arrested by Ofc. Ronald Gorneau for improper behavior and obstructing justice on August 9.